Work. Hunt. Play. Fish. Repeat. We love the Big Bear, raved ATV magazine. 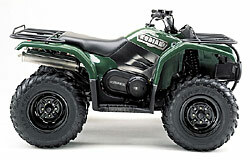 It’s the most nimble ATV in its class and slices through tight woods easily. Lofty praise…especially for a 4WD utility machine. But then, the Big Bear® 400 4x4 has been captivating the masses for a few years now and not just with its class-leading agility. First of all, theres its veritable torque monster of an engine: 400cc of air/oil -cooled, four-stroke workhorse routed through a semiautomatic transmission and shaft drive that features all-new, push-button On-Command In/Out 4WD, so you now have your choice of sporty 2WD or heavy-duty 4WD. Then there are dual front disc brakes for tremendous stopping power in the harshest of conditions. The speedometer/odometer help you keep tabs on where youve been and where youre going. Plush suspension. Heaps of ground clearance. Huge cargo racks. Yep, its all here. And its incredibly priced to boot. The Big Bear 400 4x4. Get ready to fall in love. New wrinkle finish front bar carry and cargo racks are super-durable and can pack a class-leading 264 total pounds (88 front, 176 rear) of payload. Potent 386cc SOHC 4-stroke single delivers reliable, class-leading low-end and mid-range power to tackle the hardest chores and toughest trails. Heated, semi-oval slide 33mm BSR Mikuni carburetor provides seamless throttle response and incomparable cold weather performance. Large-capacity oil cooler with cooling fan helps maximize engine efficiency, even under heavy loads. Industry-exclusive, push-button On-Command switches from 2WD to 4WD as needed. Constant-mesh 5-speed transmission with automatic clutch, reverse and super-low, stump-pulling first gear. Push-button electric starting in any gear backed up by auxiliary recoil starter. Specially designed stainless steel muffler and header provides superior power characteristics, exhaust sound and high durability. Reliable, low-maintenance front and rear shaft drive. Special, compact frame design uses fewer components to reduce weight and provide lighter steering, a tighter turning radius and superior durability. Class-leading turning radius provides maximum maneuverability on tight trails and while working with heavy equipment. 33.7" seat height creates a low center of gravity for enhanced handling. 9.7" of ground clearance for superb terrainability. Independent double wishbone front suspension with 5-way preload-adjustable shocks and 5.9" of travel. Rugged steel swingarm and single rear shock features 5-way adjustable preload and 5.9" of travel. Huge 25 x 8-12 front and 25 x 10-12 rear tires further boost ground clearance for enhanced handling and terrainability. Specially designed A-arms feature removable ball joints to ensure smooth operation and outstanding reliability. Frame features built-in winch mounts for simplified adding-on of accessories. Speedometer with odometer/tripmeter adds greater versatility and allows rider to keep track of engine maintenance intervals. Center-mounted trailer hitch can hook up over 900 pounds of payload and pulls load straight and true. Heavy-duty, full-coverage A-arm and CV joint boot protectors help prevent damage to boot covers. Mud/water-resistant automotive-type DC power outlet easy to use for a wide range of accessories. Flat-style handlebars help lighten steering effort and deliver greater rider comfort. 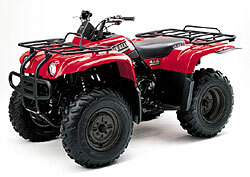 Large front and rear fenders with inner splash guards offer excellent mud and splash protection. Large-capacity, 4-gallon fuel tank has a built-in gauge. 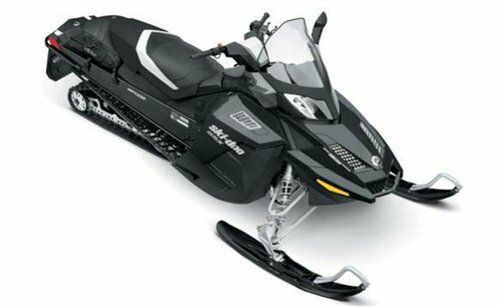 Maintenance-free 18-amp-hour battery provides extra starting power, even in cold weather. Underseat marine-spec electrical components ensure maximum protection from the elements and easy access. Bright multi-reflector 30-watt headlights feature wide positioning to maximize low-light and nighttime visibility.